One of the biggest Bitcoin exchanges, MtGox, has gone offline. Its CEO Mark Karpelès is not available any longer, his whereabouts being unknown. Holders of Bitcoin accounts on MtGox are gathering in front of the company's Tokyo main office in protest of the MtGox closure of all transactions for the time being. The exchange has been hit by technical issues and recently halted all customer withdrawals of the digital currency after it spotted what it called "unusual activity". It seems that hackers succeeded in draining 744.408 Bitcoin token worth between 220 and 370 million Euro (depending on the reference value applied). The move is a setback for backers of Bitcoin, who have been pushing for greater adoption of the currency. Meanwhile, six other major Bitcoin exchanges issued a joint statement distancing themselves from MtGox. The move by MtGox to halt withdrawals had resulted in a sharp decline in the value of Bitcoin. Having reached its maximum value of 1000 Euro in November 2013, the rate of exchange for one Bitcoin unit remained stable at 600 Euro in January 2014. In February it dropped to 400 Euro as was reported by other trading platforms for Bitcoin tokens like btc-e.com and bitcoin.de. The exchange rate reported by MtGox at that time was even slightly lower. After alleged hacker activity, that rate finally dropped to yesterday's actual value of 100 Euro. cryptic statement posted on the MtGox website yesterday afternoon. The closure of the site did not "reflect the resilience or value of Bitcoin", said a statement from representatives of several other Bitcoin exchanges, including Coinbase and BTC China. 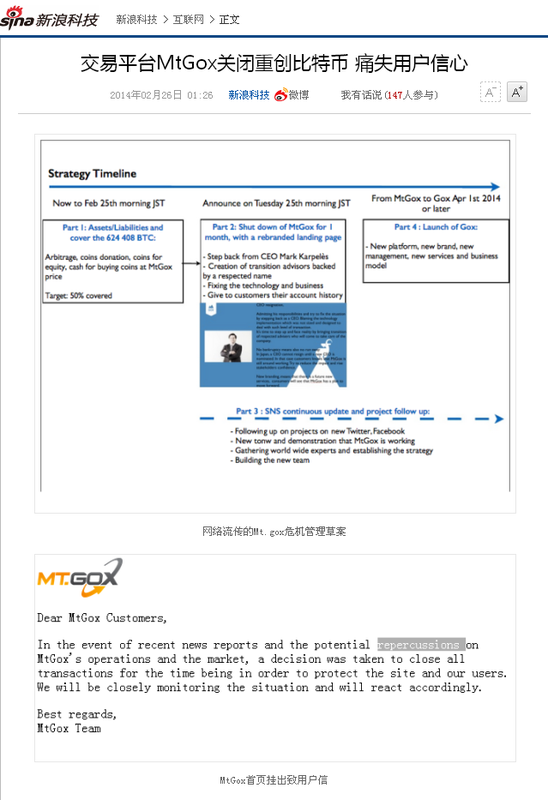 "This tragic violation of the trust of users of MtGox was the result of one company's actions. "As with any new industry, there are certain bad actors that need to be weeded out, and that is what we are seeing today. Bitcoin is often referred to as a new kind of currency. But it may be best to think of its units being virtual tokens rather than physical coins or notes. However, like all currencies its value is determined by how much people are willing to exchange it for. This provides an incentive for people to provide computer processing power to solve the problems. To compensate for the growing power of computer chips, the difficulty of the puzzles is adjusted to ensure a steady stream of about 3,600 new Bitcoins a day. There are currently about 11 million Bitcoins in existence. Since there is no registry of these addresses, people can use them to protect their anonymity when making a transaction. They operate like privately run bank accounts - with the proviso that if the data is lost, so are the Bitcoins owned. You Better Buy Stamps ! Today, China's People TV channel CCTV 1 comes with the news of a high-ranking meeting of Communist Party leaders dealing with internet security. That meeting should have taken place only some hours ago. [While] presiding over the opening of the first conference of a leading group from the [CPC] Central Committee [and which is addressing] Internet Security and informatisation, [CPC chairman] Xi JinPing underlined [that] a general layout of plannings [requires] each side to blaze new trails of development. [It needs] to actively [transform] our country into a powerful internet nation. - [Prime minister] Li KeQiang and Liu Yunshan [a member of the CPC's political bureau] were attending [the meeting]. Even though the official bulletin doesn't mention Bitcoins, that item can be expected to establish an important subject in the discussions behind closed doors, even more as a remarkable number of Chinese internet users already adopted that virtual currency. That's why China's government had earlier emphasized the risks of using "Bitbi" when it stated that Bitcoins are not supported by any national currency system. However, the need for some kind of virtual money is not generally rejected by China's authorities. Taiwan, on the contrary, seems to be much more worried: When the first public automat for money exchange into Bitcoins was installed in Hong Kong some weeks ago, Taiwan's authorities turned down the operating company's request to install a similar device in their country. "The Web isn't too good in opposing a monopoly, China's Web will therefore accomplish next to nothing." Three days ago, CNN reported about recent activity of "Boko Haram بوكو حرام", a militant Islamic group usually operating in Northern Nigeria, a region dominated by Muslims while the Christian population is mainly living in the southern part of the country. 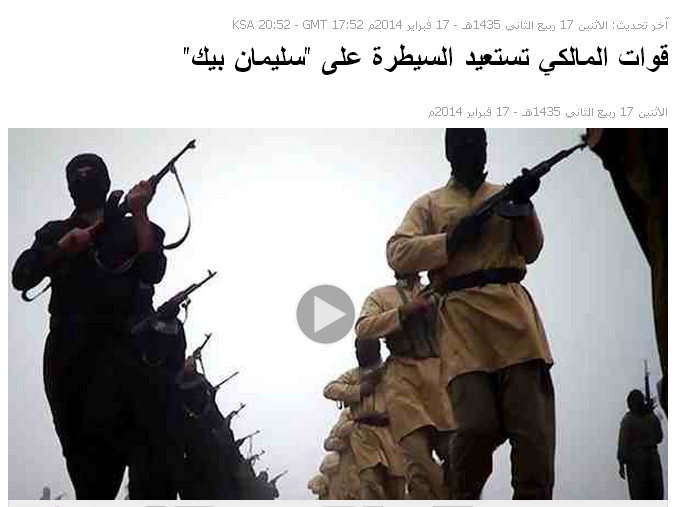 Further reports on Boko Haram can be found on the Arabic service of Sky News. Their latest news report was published yesterday, February 19. Boko Haram on a Nigerian village last January. Nigeria ..... Boko Haram is threatening to [concentrate its efforts] on petrol. In a video, Boko Haram group's leader "the rigorous" Abu Bakr [Shikawu] threatened to launch an offensive against the oil region in Southern Nigeria. [That video's] adaptation was mentioned by "France Press" agency [i.e. AFP] on Wednesday [i.e. February 19]. According to different reports from ORF, Austria's National TV, Boko Haram should have staged two bloody attacks in Borno state recently. That one already mentioned above and which left 106 villagers dead and another one that took place in Bama township only some days later and resulted in a death toll of actually 60. Public buildings should have been severely damaged during the Bama incident while Nigerian military is quoted having killed numerous insurgents in an air raid that followed the attack. ORF added that since 2009 thousands of people should have been killed by Boko Haram. Nigeria's federal state of Borno is seen as their main stronghold where civilian rule has been officially replaced by military rule since 2013. Joint forces from Nigeria, Niger and Tchad are actually trying to control that region. 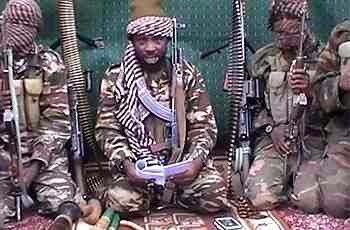 Boko Haram is said to be fighting for about ten years to establish an Islamic emirate in Northern Nigeria by means of terrorist attacks that are directly targeting Christian villagers as well as public installations and Nigerian government authorities. Visitors to "blueprint news" who came from Abuja and other parts of Nigeria. Some of them are regular visitors ! The street gangs of Kano at Kufar Mata Road and the militant Islamists of Abu Bakr in Borno province. Urban dropouts in a traditional Muslimic society and the bloody restoration of Islam by Boko Haram. A scientific approach on sociological changes in Nigeria can be found here ! Detonations in Baghdad and military engagements in Saliman Bey. The general military council [in charge of] Iraqi rebels confirms total military control over the clans of Saliman Bey community. Troops of al-Maliki regain control over "Saliman Bey"
The [administrator] of "Saliman Bey" district in Salah ad-Din province, ....., declared today, Monday [February 17], that joint forces of military and federal police reestablished control over the district after [their] invasion [from three directions], ..... killing more than 15 armed [persons] while [making clear] that [such armed] force was interrupting the main route between Baghdad and Kirkuk. A series of detonations from mined cars and explosive charges aiming at a multitude of quarters in Baghdad resulted in the killing of almost 20 people. 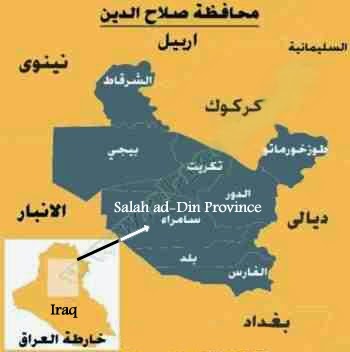 The detonations took place in ..... [editor's note: four quarters of Baghdad that are marked in the above map] ..... and were executed with mined cars and explosive charges. The following news are covering the ongoing fight between Islamic militants and government troops in Iraq. For more information, please refer to earlier blogspots on that subject. Al-Maliki: "Daesh" arrived in Iraq via refugee camps. The chef of Iraq's government, Nuri al-Maliki, is considering that "Daesh" organization has arrived in Iraq via refugee camps at the time it met with clan leaders in Anbar [province]. And declarations of al-Maliki appeared [regarding] the ending of [such] meetings with clan leaders from Anbar [province] after a year of seeking refuge and of claims the government of Iraq ignored until today's visit of al-Maliki to the province, when he was accompanied by the minister of defence and received by the [regional] leadership and clan leaders. Iraq's army killed 40 armed [rebels] from Daesh in Falluja. In a declaration dating from Thursday [i.e. January 30], Iraq's ministry of defence confirmed the killing of 40 armed [rebels] belonging to the organization of an " Islamic Nation in Iraq and Syria / the Levant [ISIS / ISIL / Daesh] ", the destruction of weapons and, as well, of four posts of command and [administration] for the organization in Falluja, Anbar province. The following excerpt has been taken from an anonymous personal comment broadly published on some kind of patriotic website and that is directly linked to the main page of People's Network, the online edition of China's semi-official People's Daily. Even though the comment is marked as not necessarily representing the opinion of People's Network, I deemed it worth mentioning. Above: U.S. President Obama and Japan's prime minister Shinzo Abe on a ship carrying the flags of both countries. That picture, partly covered by the comment's title, marked the direct link from People's Network. A change of style to answer the contradictions that affected China in recent years. Is America using Japan as a pretext to play with China ? These years have seen what seems to be a lot of contradictions between China and Japan. On the international stage, each [of them] at the time of its surfacing looked as if such kind of contradiction could probably lead to a sharp conflict at any time and could even get out of control. At least myself is considering the significant problems that emerged between China and Japan during these years, their [essential] key issues, as not being caused by Chinese - American problems but accompanying them. 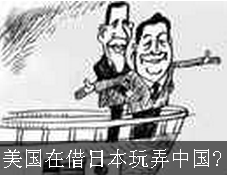 America is the most important creator of Chinese - Japanese contradictions and promoter behind the scene, the starting point of an ultimate settling of such major problems. And I consider [we] ought [to begin with the provocative answer from] the American side. That one who started the trouble should end such style of handling problems and which is the true cause at the beginning of contradictions. 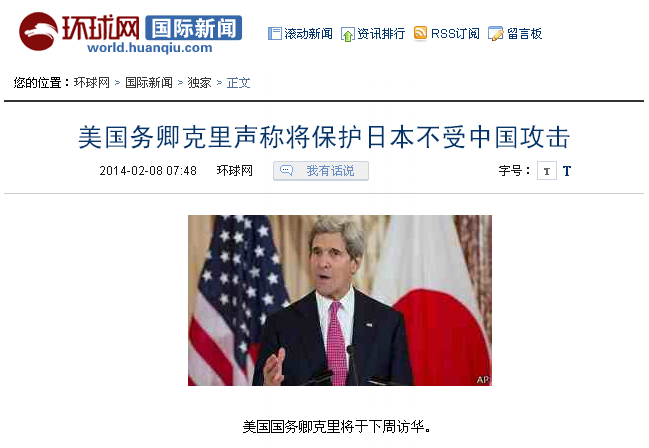 U.S. secretary of state Kerry claims to ensure Japan's protection against Chinese attack.